I have great luck with a fall garden. Less heat, watering and bugs. Looking forward to fall already. Me, too!! It will be cooler. @MrBooker wrote: I have great luck with a fall garden. Less heat, watering and bugs. Looking forward to fall already. OK, you will have to help me get my stuff together, then. I am always too late. I just today started some lettuces indoors. They will not germinate in the heat. I plan to put them it in 3-4 weeks, maybe less. I planted those yellow bush bean seeds (I have never done this—total experiment!). $1.29 seed packet! And I only used approx 1/3 of it...I love that. So seed thrifty! Last year I waited until about mid August to plant my turnips and beets. I think I'm going to start a little earlier this year. Every year is different. @MrBooker wrote: Every year is different. Yes, it is! Thanks, Mr. B—just post when you are starting seeds, in or out? I assume out for the most part! Sort of rained here. Promises of a seasonal cool-off, from 90s to 80s in the next couple days. Watered again, surveyed a developing Indian Dance cuke!!!! New for me, had a zero cuke year last year. So far, so good. 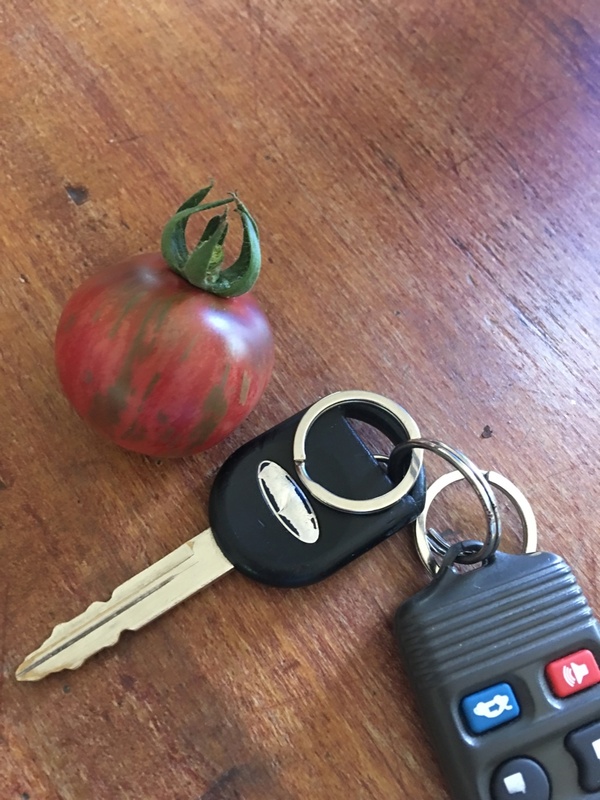 Had a major mishap Sunday with pruning the tomatoes....I cut half of a Cherokee Purple off with 4 rather nice developing maters. Green, 3-4 inches. I am not into fried green tomatoes. I gotta watch it with the pruners. Not the first time. The under-developed eggplant continues to put the giant in the south annex to shame fruit-wise. What is that???? Flowering like crazy, small fruits. Finally the purple pole beans are flowering. Most of the bush beans are up. Little sucker start of unknown tomato is gonna go in this weekend! What’s going on out there, Midwest!? OK, impatience rules at my house. Planted the “sucker” mater experiment, heavily pruned. Caged, which I don’t normally do but I need to give it some grace! 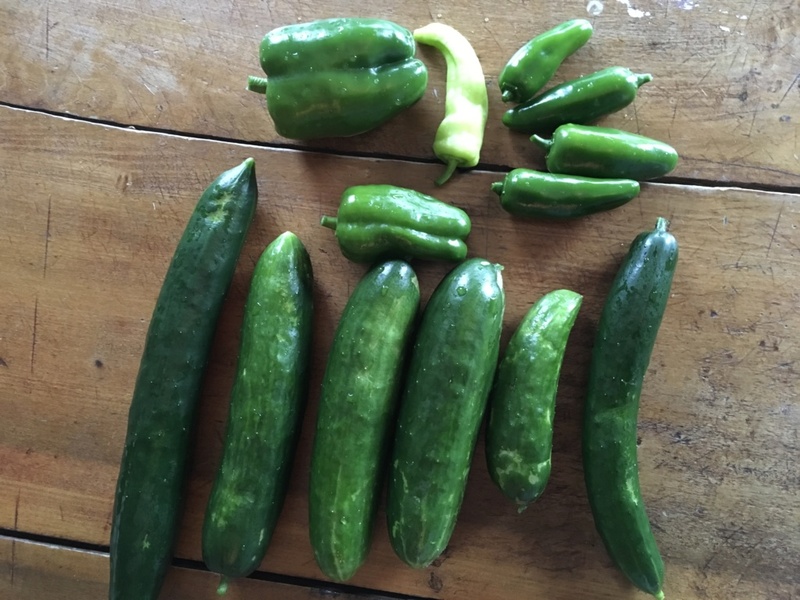 Picked the Indian Dance curvy cuke, and a small little strange cuke (?) and a million jalapeño peppers!!!!! One plant! None next year. Had to prop up my trellis with the pole beans—pulled forward with the weight of the beans. YAY! Pulled 3 garlic bulbs. In the garage. Pungent when curing! Love it though! Cooler here, seasonal, low 80s. Raining here, we need it. Nice to get a break from the heat and watering! Supposed to be a rainy, off and on, all weekend. I am OK with that. I will get out there between the raindrops and see what is ready. Hope there are some cukes! I am hungry for cucumber and onion salad! Guess what I’m making??? Cucumber and onion salad!!!! On a sad note, no patty pan squash this year. Something (crazy sideways wind??? I was out of town) clipped my squash off at the root, just snapped clean off! Oh well, delicata is all I got this year! Fingers crossed! Picked this stuff yesterday! My first 2 purple pole beans—ate ‘em raw! Getting ready to pull all the garlic. Am gonna thin the lettuce seedlings tonight. Will need to fluff up the bed with the taters after they are harvested. Stuff needs watered, but might rain...fingers crossed! @sanderson wrote: Cute little Rose-colored googles! LOL, my daughter’s! I liked them! They are really good ones, Speedo Vanquisher 2.0 these have mirrored lenses. Is she a swimmer like mom? @sanderson wrote: Is she a swimmer like mom? Much better than I! She was 4 time State, and still swims USA NCAA Club at OSU. She is amazing. 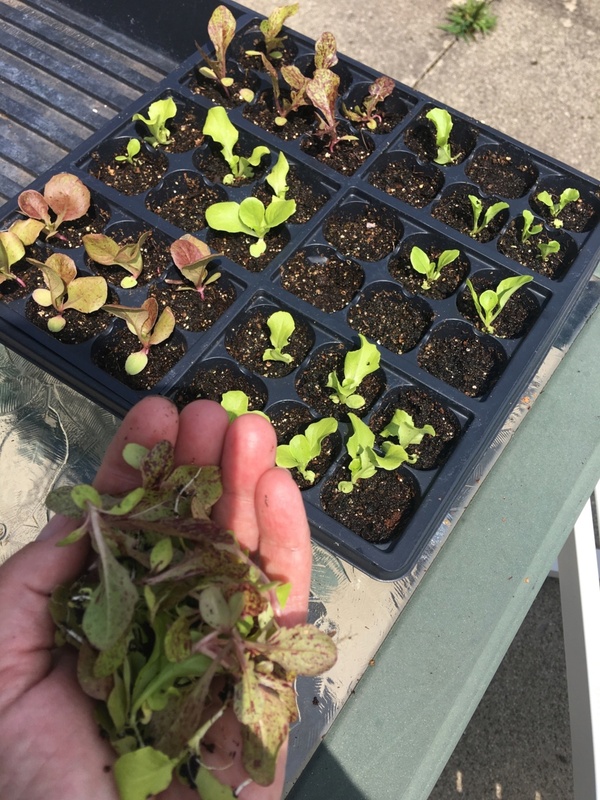 Thinned my lettuces. Got my first gorgeous small ?cherry tomato!!! @sanderson wrote: Congrats to your daughter. Not sure. Freebie from Baker’s seeds... just gave it a try. I usually grow Sunburst. Now I have room for lettuces, (already started), radishes and spinaches which I will start this week. And now 3 skinny eggplants. Will pan fry them this week. With some garlic! That is what is is!!!! Dang! Thanks, sanderson, she is very modest. You're garden is crankin' there, SR! Good for you. No toms or peppers here yet, and not many cukes. Carrots never sprouted. And now 3 skinny eggplants. Will pan fry them this week. With some garlicYou're garden is crankin' there, SR! Good for you. Grrrr! Last year for me, it was pretty bad. Can you believe it? July has come and almost gone! 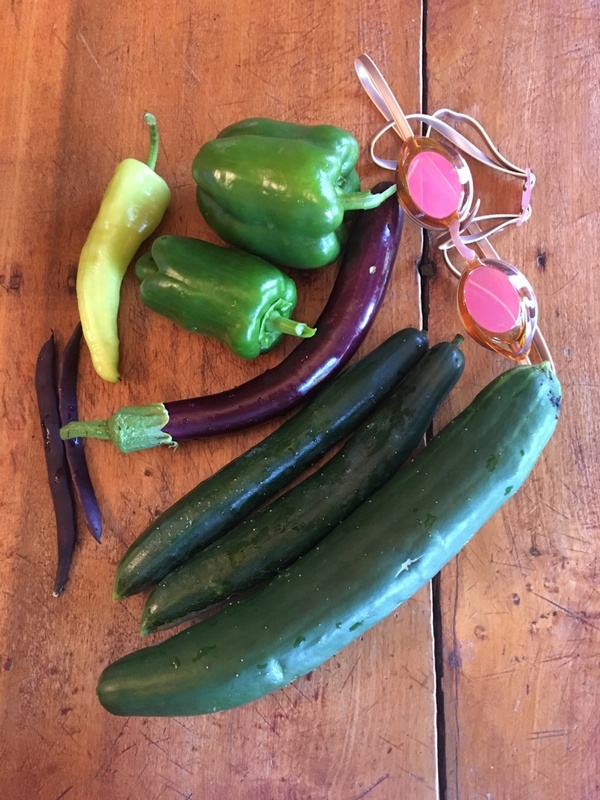 Things are starting to come off in droves from the garden. Going to try to actually make a Fall garden happen this year; will transplant the starts of the lettuces this weekend. Also will direct seed radishes and spinaches!